Julianne Moore wore a custom made Givenchy Haute Couture by Riccardo Tisci outfit to the 72nd Annual Golden Globe. The evening silver to black degrade dress all over hand-embroidered with paillettes and ostrich feathers, worn with black and silver metal clutch and black suede platform shark-lock sandals Jewelry by Chopard. Justin Theroux wore a Givenchy by Riccardo Tisci FW2014 outfit to the 72nd Annual Golden Globe Awards. The Black shawl collar grain-de-poudre tuxedo with satin cut out details, worn with white poplin shirt, black satin tie and nappa leather derbies with metal details. 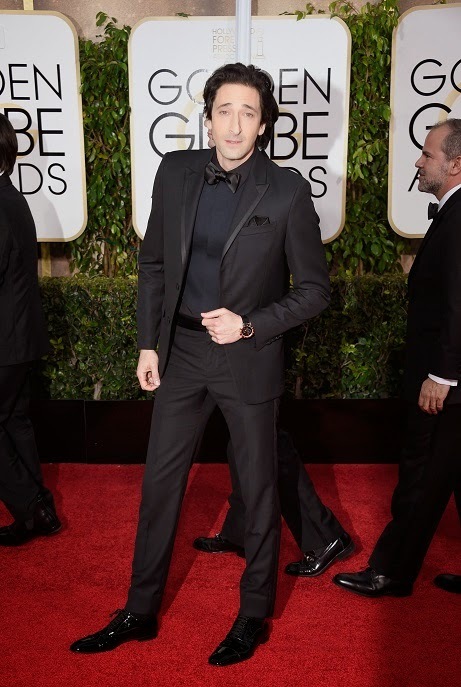 Adrien Brody wore a Givenchy by Riccardo Tisci FW2014 outfit to the 72nd Annual Golden Globe Awards. The black grain-de-poudre tuxedo with gros-grain cut out details, worn with black poplin shirt, black satin bow-tie, black satin handkerchief and patent leather derbies. Jeremy Renner wore a Givenchy by Riccardo Tisci FW2014 outfit to the 72nd Annual Golden Globe Awards. The black shawl collar grain-de-poudre tuxedo with satin cut out details, worn with white poplin shirt, black satin bow-tie,white satin handkerchief and patent leather derbies.